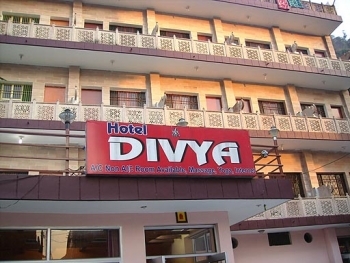 Hotel Divya is one of the best budget hotel in Rishikesh with warm hospitality and basic amenities. The hotel is conveniently located near Lakshman Jhula which is one the famous tourist spot in Rishikesh. Being surrounded by the lush green mountains with holy Ganga flowing by the side, the hotel has an excellent ambience. It is a perfect place to get rejuvinated from the hustle bustle of the moribund city life. Local tourist attractions are Triveni Ghat, Ramjhula , Lakshman Jhula, Marine Drive and Swarg Aashram. A view of River Ganga at Sunset looks very beautiful. The Hotel is located near Laxman Jhula Taxi Stand at a walkin distance from famous Laxman Bridge. All rooms of the hotel offers a beautiful view of the Ganges. In an effort to serve their best the hotel is stocked with all basic amenities and facilities to make the visitors stay worthwhile. Rooms are spacious and well furnished with attached bathroom and a private Balcony which over looks the river. The hotel offers a small restaurant which offers lip smacking dishes of Indian Cuisine only. The restaurant is designed inspiring the Culture, Language and tradition of Uttarakhand. It also provides other dishes on demand. Over all it is a value-for-money place. - Doctor On Call, Spa and Yoga, Internet Cafe, Special Arrangement for Water Rafting, 24 hrs room service. The hotel is easily accessable via motor roads. Nearest Bus Stand is Rishikesh which is 20 minutes drive away. One can also opt for railway transport which has connectivity from all major cities of India to Haridwar. From Haridwar it is easy an hour drive to Rishikesh. Major Railway Station is Haridwar Junction at a distance of 22 kms. Guest Visiting By Air can Reach here by JollyGrant Airport (15 kms).